Do you have diabetes? Do you have an open sore that just does not heal? Is it red, painful, draining and smells funny? Chances are you have a diabetic foot ulcer. One in four people with diabetes develop at least one ulcer post-diagnosis. Foot problems associated with diabetes lead to deep infection, sepsis and lower extremity amputation. Foot ulcers commonly appear under the big toe and balls of the feet. They can cause damage to the feet down to the bones. They are identified by drainage from the affected area along with a lump which may or may not be painful. While poor blood circulation and high blood sugar are the common causes, good foot care and use of therapeutic orthotic devices can decrease the ulcers. Diabetic neuropathy: Diabetes causes nerve damage which in turn causes tingling pain and loss of sensation in the feet. Impaired sensation makes the feet vulnerable to cuts and sores which may even get infected. Though an ulcer alone is not life threatening, but if left untreated for long it can get infected causing sepsis. It may even result in amputation. 67 percent of all lower limb amputations in the U.S. result from diabetes. 80 percent of these amputations were preceded by a foot ulcer. Thus, an ulcer not improving for a prolonged period of time requires medical intervention. Manage your diabetes- Making healthy lifestyle choices can keep the blood glucose normal, thereby, preventing diabetes-related foot problems. Daily foot examination- Check your feet on a daily basis for cuts, sores, swelling and infected toenails. These may or may not be accompanied with pain. Wash your feet everyday- Wash your feet in warm water on a daily basis. Dry well and use talcum powder to keep the skin between the toes dry. Keep the foot skin soft and smooth- The top and bottom of the feet should be kept moisturized. Do not apply any moisturizer between the toes as it can trap moisture and lead to further skin problems. Smooth corns and callouses gently- A pumice stone can be used to smooth corns and callouses gently. It should be rubbed gently in one direction to avoid skin tearing. 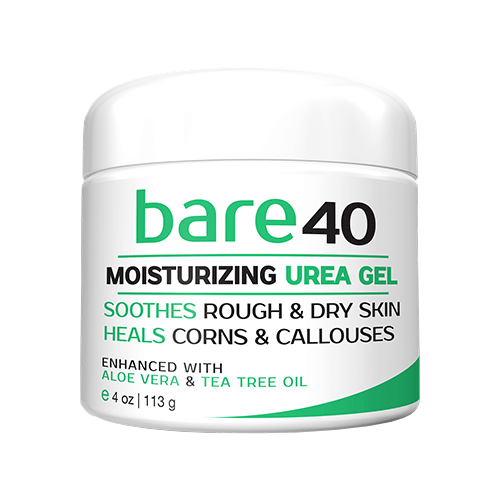 The Bare 20 Moisturizing Urea Gel, effectively removes thick callouses. It also hydrates the skin and improves blood circulation. BARE 20 is specially formulated to remove thick, callused areas while re-hydrating skin to a healthy appearance, a softer, smoother and more ravishing skin surface. It is fast absorbing and provides greaseless soothing relief. Keep the toenails trimmed- Trim the toenails straight across and smooth them with a nail filer. Wear shoes and socks at all times- It is important to keep your feet covered, even when indoors. This will help avoid blisters and sores. Use well-fitting, clean and lightly padded stockings. Keep your feet protected from hot and cold- Wear warm shoes and stockings in cold weather. If going outdoors in a hot weather, apply sunscreen on the feet to avoid sun burns. Maintain blood flow to your feet- Keep your feet lifted when sitting for a long duration. Avoid sitting cross-legged for a long time. Wiggle your toes for a few minutes twice or thrice a day. Quit smoking as it reduces blood flow to the feet. Movement is the key. A physically active daily regime is very important to keep the diabetes in check. Forms of exercises easy on the stomach should be followed. Therapeutic footwear and orthotic insoles- Studies have suggested that those with diabetes and using therapeutic footwear, incidence of foot ulcers and amputations lowered significantly. Customized orthotic insoles also helped here. So, while diabetic ulcers are unavoidable to a large extent, adequate foot care, and use of therapeutic footwear and orthotic insoles can go a long way in prevention and healing.